Sorry it has been sooooo long since I updated. Thought I better do a VERY quick one and share some online photo albums from September and October. 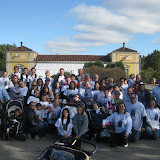 Our MDA Zoo Walk was SUPER successful and fun! Thank you for all the donations and for all those who joined the Ally’s Angels Team. We had about 70 team members and raised over $3000. The girls have been SUPER busy with school and activities. Ally has gone almost every day and now even goes alone on the bus with our magnificent home nurses (who have been with us a long time). We are praying she will be able to go for as long as possible (permitting good health). Melissa has been doing wonderful learning to read in 1st grade and enjoys Girl Scouts every week. Kristyn stays very busy with her varsity cheerleading, schoolwork, and friends. Halloween was a ton of fun this year!!! Ally’s school goes ALL out and has a HUGE celebration. It was really a neat experience for her and me. Melissa was in a school parade and had a party. Kristyn had a cheer party and went to a haunted house. 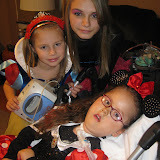 Today, we went to Disney Live – Mickey’s Magic Show with the Shofner Family and then did one block of Trick or Treating. Please pray for a healthy fall and winter and for all of the children/adults who have been sick. This is an especially tough time for SMA children and several of Ally’s friends have been in the hospital. We hope they can all be better and home with their families soon. We know how tough illnesses can be and are also praying that with Ally’s trach we can avoid the hospital for a super, super long time. Happy Fall and Happy Halloween!!!! Be sure to click on the below Album Covers to see tons of pictures and even some short videos as you scroll through. Enjoy and let us know you visited!